"I always say Tongva women never left their ancestral homeland, they just became invisible. 'How do we make ourselves not invisible?' is the question I ask every day." Julia Bogany is a member of the Tongva tribe, is on their Tribal Council, and is their Cultural Consultant. Julia constantly, incessantly, voluntarily teaches, attends meetings, and sits on Boards to help her tribe; she usually does this without pay. Her calendar is full a year ahead of time. She has worked for over thirty years for the American Indian community for her Tongva tribe. She has provided cultural, FASD, ICWA training and workshops in the Los Angeles, San Bernardino, and Riverside areas. She has also provided workshops in Sacramento for the California Rural Indian Health Board Woman's conferences. Ms. Bogany teaches Tongva language and cultural classes. She attended many language workshops around the country to learn, strengthen, and enhance her tribe's language. 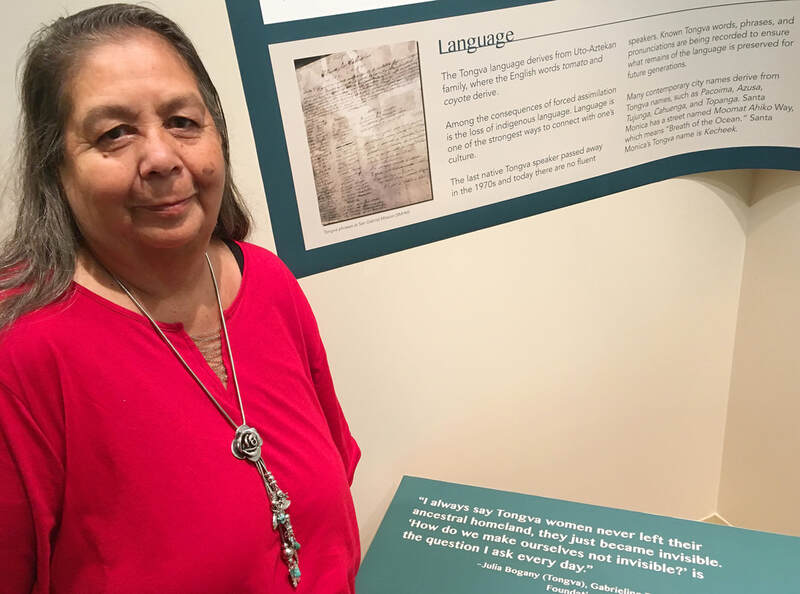 She helped to reawaken and revive the Tongva language, as well as assemble a Tongva dictionary. She is Vice President of the Keepers of Indigenous Ways (KIW), a non-profit group of the Tongva. She teaches basket weaving and also uses it to teach math to youth. She is President of Residential Motivators, her own non-profit consulting firm. Ms. Bogany attended a SAMHSA FASD Center for Excellence training in 2005 and has provided FASD classes since. She has years of training in Child Development, Indian Child Welfare (ICWA), and Native American Studies. She is a strong advocate for ICWA and Fetal Alcohol Spectrum Disorders. She is fluent in English and Spanish. Ms. Bogany serves on several committees and organizations: Community Health Worker for Mental Health, California Indian Education Association, Children Court L.A. Round Table for ICWA, and runs co-ed and women's circles. She is President of Kuruvanga Springs, a Representative for California tribes on Route 66, a member of CNAC (California Native American College board), and Pitzer College Elder in Residence. She teaches native culture and history and women's issues at Scripps, Pomona, Harvey Mudd, and the Claremont School of Theology in addition to Pitzer. She works on thesis with students, and assists with the summer Native Youth to College program. In September 2010 she received the Heritage Award from the Aquarium of the Pacific at their sixth annual Native American festival, Moompetam. She has also been nominated for Coastal Commission for the State of California and is a Stake Holder Consultant of 200 parks in Los Angeles County. Ms. Bogany consults with and trains teachers and school boards on how to revise their curriculum to reflect the correct history of California and California tribes. She wants to change the future for her tribe, children, grandchildren, and great grandchildren; this is her way of doing it. She cares for her great grandchildren and teaches them arts, crafts, language, and culture. All the work she's done for the past twenty years is for their future and for the future of her Tongva tribe.